These are the best and most unique dried fruit chocolates around. Premium sun-ripened apricots, whole strawberries, whole blueberries and whole cherries - dried gently so they're tender, moist and a little bit chewy. Then they are dipped in sweet milk chocolate and covered with a delicate pastel glaze. The result is exceptionally silky and smooth, with a sophisticated flavor. The Apricots are covered with a Pastel Orange, Strawberries covered with Pastel Pink, Blueberries covered with Pastel Blue, Cherries covered with Pastel Red. Our 12 oz and 2.5 pound Fabulous Foursome are our most popular items and are shown below. 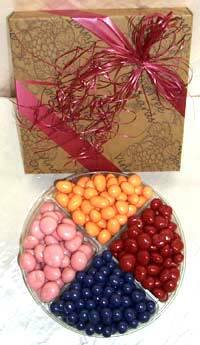 The individual fruits (not shown) can also be purchased below in 12 oz Gift Boxes. 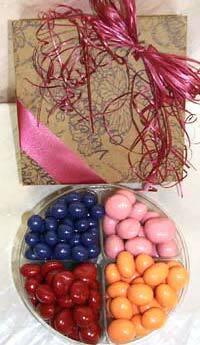 Fabulous Foursome - Pastel Chocolate Fruit - (Apricots, Strawberries, Cherries and Blueberries) - 12 oz. This is a full 2 1/2 pounds of our Fabulous Foursome - Pastel Chocolate Fruit (Apricots, Strawberries, Cherries, Blueberries). These "combo" packs are our most popular items.